Friday night I got together with friends to record a podcast about another interest of mine - points & miles. 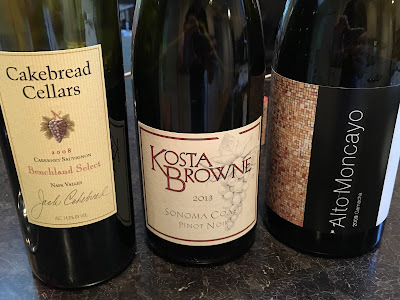 There's certain occasions when I want to share esoteric recent finds, but this was an occasion to introduce wines I have a personal connection with. And for times like these I want to "pay it forward" and share wines that friends shared with me that got me into wine. Cakebread Benchland Select was the wine that go me into wine. Me and my wife were newly married and transitioning from drinking mostly beer to wine. A friend came over with a bottle of Cakebread Benchland Select and it was transformative. This 2008 was showing every bit as well. A superb Napa Cab that displayed both rich, inviting fruit with serious supporting balance. For me, there's no more utterly enjoyable wine to drink than Kosta Browne's rich, fruit forward Pinot Noir. I'm just hard-wired biased towards the flavor profile of California Pinot Noir and KB always delivers. In isolation it's splendid but in comparison it's extraordinary. The stuff just tastes amazing, and it goes much deeper than that. Two definitive wines I consistently adore from Spain are El Nido Clio and Alto Moncayo. I went with the 2009 Alto Moncayo because it's always fun to break out a "100 point wine". The 2009 is a stunning 16% alcohol (how do they hide it?) but showed so well. Spectacular wine. A crowd-favorite among giants. Question of the Day: What are some of the benchmark wines you've discovered over the years? What wines would you break out with friends who aren't yet obsessed with wine to help them understand what makes wine special to you? I find that wine pairs brilliantly with travel. And points & miles are one way to make travelling to wine destinations possible. I'd love it if you gave this podcast and a listen and if you've got any questions on points & miles to connect on Twitter (@RobertDwyer) and/or drop me an e-mail.